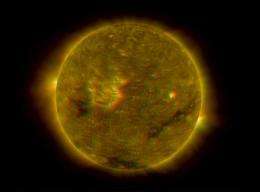 (PhysOrg.com) -- An international panel of experts has released a new prediction for the next solar cycle, stating that Solar Cycle 24 will peak in May 2013 with a below-average number of sunspots. Led by the National Oceanic and Atmospheric Administration (NOAA) and sponsored by NASA, the panel includes a dozen members from nine different government and academic institutions. Their forecast sets the stage for at least another year of mostly quiet conditions before solar activity resumes in earnest. "It turns out that none of the models were really correct," says Dean Pesnell of the Goddard Space Flight Center, Greenbelt, Md. NASA%u2019s lead representative on the panel. "The sun is behaving in an unexpected and very interesting way." The only thing interesting about this is GSFC admitting their models were worthless. The rest is institutional "science". I'm just terribly impressed that they didn't explain that the sunspot number is 'the daily average number of sunspots' as so many recent artilces have done. As to climate change; they'll simply argue that once the solar minimum ends, we're really in for it. Once the sun starts heating the earth, why there'll be so much CO2 & CH4 in the atmosphere it'll practically catch on fire. Maybe its time to dust off last centuries papers hypothesising that the sunspot cycle is related to the suns orbit around the solar systems centre of gravity, the barycentre. 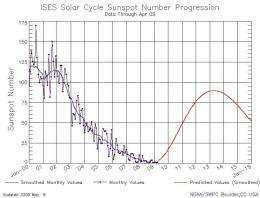 Those papers predicted that this cycle and the next two would have sunspot numbers similar to those during the Maunder minimum with a return to 'normal' near 2050.